The fully automated spectroscopic ellipsometry featured by the ellipsometer SENDURO® relieves the user from manually aligning the sample by height and tilt required for highly precise and repeatable spectroscopic ellipsometry. The patented automatic alignment sensor strongly reduces operation errors, works for transparent and reflective samples, and makes automatic maps possible even on bent wafers. The recipe A recipe includes: Hardware settings Sample alignment Modeling Fitting Reporting mode is perfectly suited for routine applications in production, process monitoring as well as R & D. This spectroscopic ellipsometry system comes with a number of ready to use recipes which can be modified for your specific needs. The Step Scan Analyzer principle is a unique feature of SENTECH`s spectroscopic ellipsometry. The total time to analyze a sample takes only a few seconds. The SENDURO® measures refractive index and thickness of single films and layer stacks on transparent and reflective substrates. High sample throughput rate, minimized installation effort, and low cost of maintenance are the real economic advantages of the SENDURO® mapping tool. The mapping of this spectroscopic ellipsometry tool features predefined or user defined patterns, extensive statistics, and graphical display of data. The SENDURO® represents the SENTECH automated, small footprint, and compact design ellipsometer. The table top instrument comprises the ellipsometer optics, automatic tilt and height sensor, motorized sample stage, and controller electronics, all combined in one compact housing. 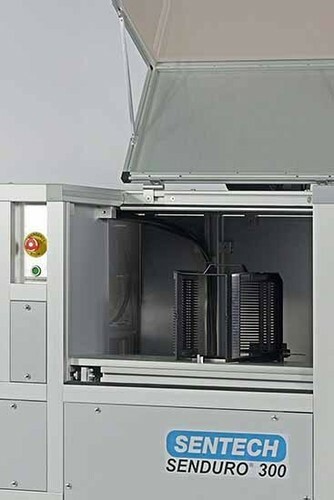 For highest throughput of our spectroscopic ellipsometry tools cassette loading is offered for up to 300 mm large wafers. in R & D range from dielectric films on semiconductors to multi-layer optical coatings on glass. The SENDURO® software for excellent spectroscopic ellipsometry features a recipe mode and an engineering mode. The recipe mode SpectraRay/4 recipe mode: Recipe selection is dedicated to easy execution of repetitive applications. Password controlled user login allows for different excess levels. In interactive mode SpectraRay/4 interactive mode: Modeling, ellipsometric measurements are enhanced by an interactive, guiding graphic user interface. Furthermore, it is possible to modify already existing recipes or to set-up new recipes using the large database of materials and dispersion models.